Jazz recordings are not only difficult to write a reviews for, they’re also problematic in their personal nature to be anything less than personally subjective for the writer … meaning that absolute objectivity is nearly impossible, with one relying on personal taste and artistic development to carry one through, especially when considering the career of a classic artist and sound. And that last statement is the most important, “considering the career,” because very few of us where there then, smart enough then, to have followed the musical and social ramifications of most jazz artists, leaving us to discover them much later, when their career is laid out in front of us as some open book, needing to be explored from the beginning to end … and in that order. Take The Beatles for instance, they exploded on the scene, leaving record companies scrambling to find other bands who had that same sort of sound, yet brought their own take on early rock n’ roll, with the hope of discovering a group who would develop and morph with time and longevity. Young was one of those, not there at the birth of jazz, yet close enough, that his musical family was made up by those he considered his parents, aunts and uncles. Please Please Me is lightyears from anything done on The White Album, or The Beatles final release Let It Be, which in all honesty, was a career that lasted for a mere 7 years. Yet through all of that, there is an undeniable core sound, that like a breadcrumb trail, can be traced back to the very beginnings … meaning that someone tossed down in the middle, or even the end of The Beatles timeline, can move forward or back with ease. That seems seldom to happen for me [again, this is subjective] in jazz, and especially when considering a career that lasted for 20 years, as it did for Larry Young, a man who like The Beatles, lived through one of the most important social and musical eras of all time in America, the 60’s and 70’s. Larry Young was influenced by all that was happening around him, social, political, musical, and cultural … certainly as both a black man, and a black musician. And while he moved and weaved his way thought those times, enlightened by Post Bop, Soul Jazz, Funk Jazz, Jazz Fusion, and into a short Avant Garde phase, Mr. Young leaves that tail of breadcrumbs throughout all of his releases, meaning that if you were dropped down in 1970, and may have cut your teeth on Lawrence of Newark, you could still flashback to Testifying with ease. In the world of jazz, I have nearly always found that the first two albums from a band or artist define who they are, and who they will be, with all that comes after, being merely a development of skill and talent, because those first two albums are usually beholding to know one. Of course one can make the case that it’s not until the middle of an artist’s career that they really discover themselves. 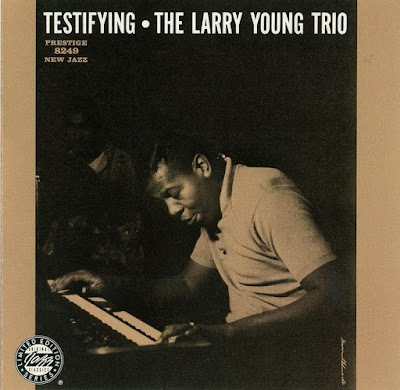 Yet there’s something different in the case of Larry Young, a man who as I said was influenced by the music and the times, acting more as a lightning rod for the social and musical sea-changes that were happening all around him. This is not to diminish the work of Larry Young, it simply means that the man was keenly aware of his surroundings, and considered those surroundings heavily when it came to his music. And to that end I want to point out the brilliance that was Testifying, because it certainly was Larry’s most defining moment, a footprint in the sand, when he was going over to John Coltrane’s home and jamming with him, before his groundbreaking development as a jazz fusion artist, playing with the likes of John McLaughin, or Carlos Santana. Testifying is all about Young’s [at 19] blues and jazz based roots, where his influence by Jimmy Smith can be heard, where he swings, and his tone and intonation are lighter, and perhaps most refined and personally articulated. Anyway … that’s how I feel about it, Testifying is Young’s most resounding achievement in that it sounds honest and to the point, never giving me the feeling that I’ve had enough, never moving left or right of center, Testifying is simply grounded in an effortless presentation and precision that stands the test of time.